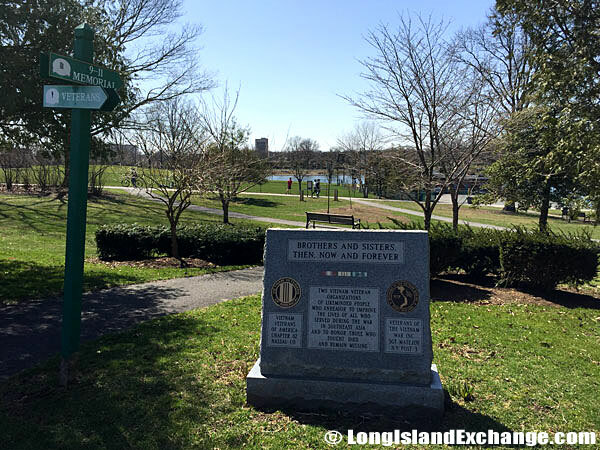 Eisenhower Park, a 930 acre park formerly known as Salisbury Park, is centrally located in Westbury, New York. It is bordered by Hempstead Turnpike on the south and Old Country Road on the north. 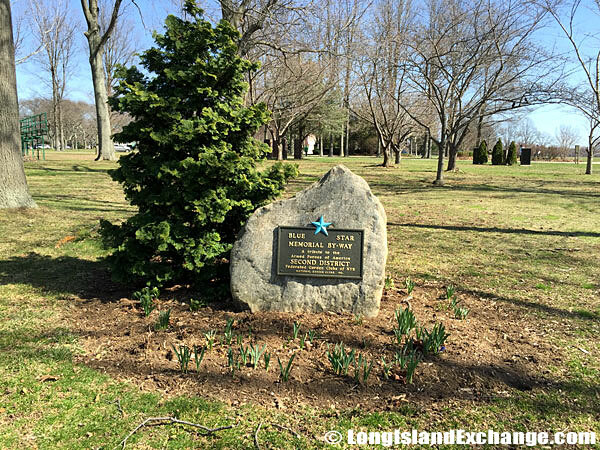 The park is home to the September 11th Memorial for residents of Nassau County. Historians say the name Salisbury originated from English colonists because the area resembled the Salisbury Plains in England, which were named after the English Earl of Salisbury. The south entrance to Eisenhower Park at Hempstead Turnpike. 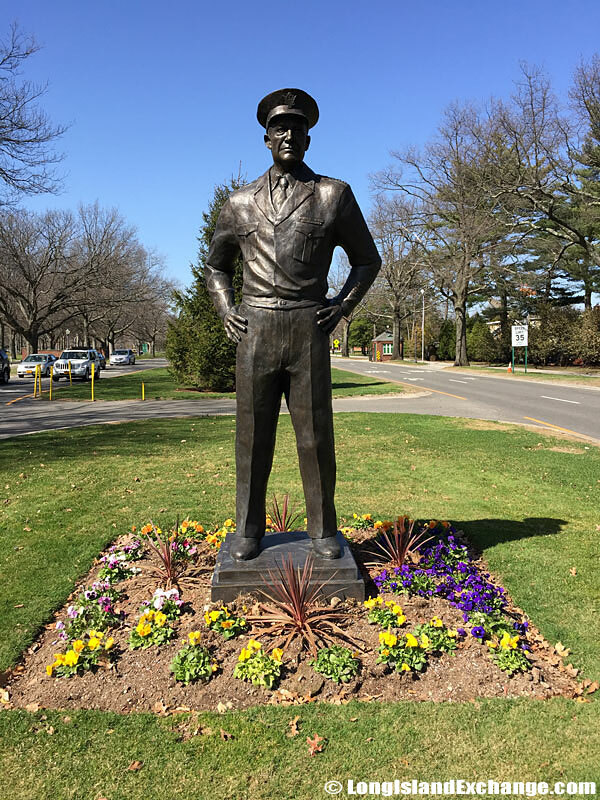 A statue of Dwight D. Eisenhower. 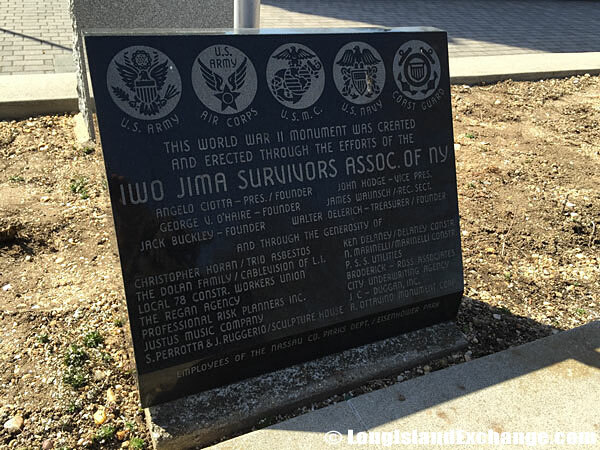 Nassau County Executive Edward P. Mangano dedicated the statue in a ceremony on Sunday, October 13th, 2013. 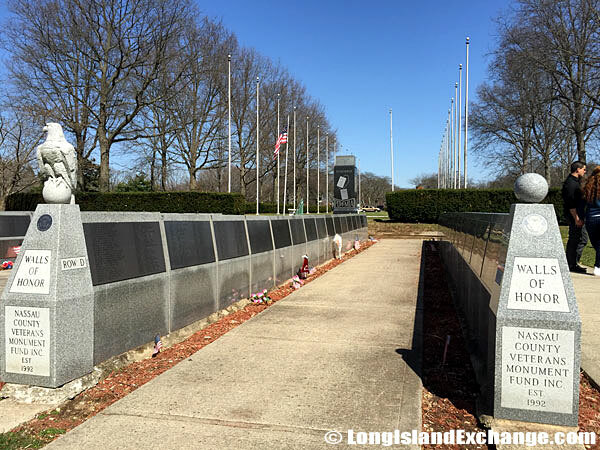 The Walls of Honor in Eisenhower Park maintained by the Nassau County Veterans Monument Fund Inc. The Walls of Honor are exactly what they state; they are Honor Walls, not memorial walls. There are more living honorees, than those who have passed. The walls are open to all those who have served throughout time. A $100 donation is needed for each name, whether one served during wartime or peace time. It is open to all, no matter where they live and it is open to those who are serving now. 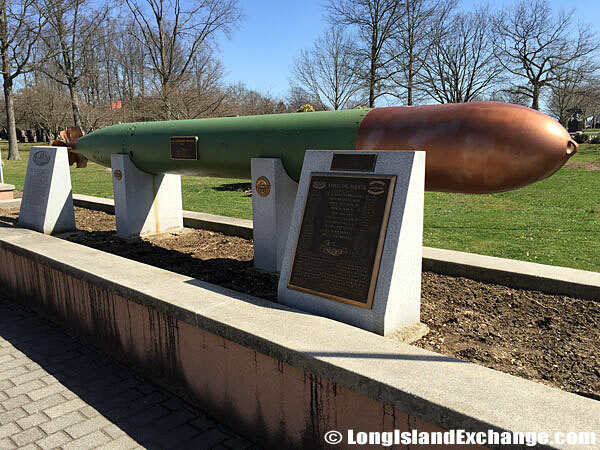 Still On Patrol; the plaque indicates that it is dedicated to the US Navy Submarines, who paid heavily for their success in World War II. A total of 374 officers and 3131 men are on board these 52 submarines still on patrol. 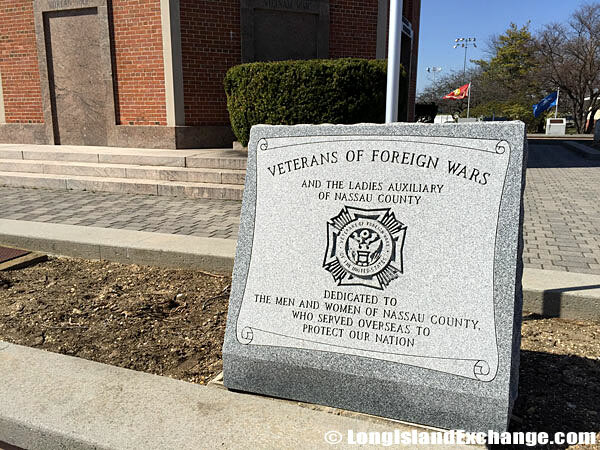 Veterans of Foreign Wars and ladies auxiliary of Nassau County; dedicated to the men and women of Nassau County who served overseas to protect out nation. In memory of the men and women of all branches of service who gave their lives for our country. 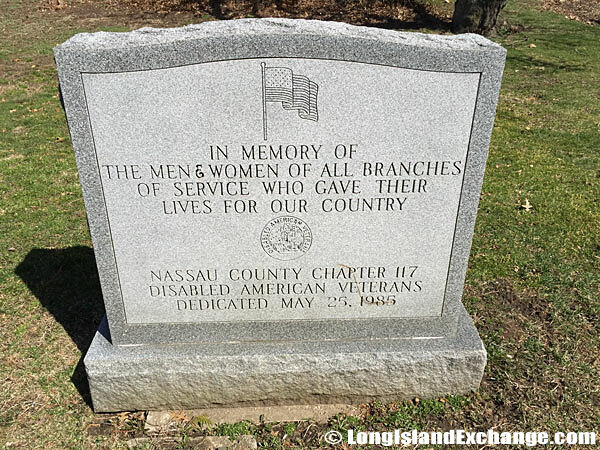 Nassau County Chapter 117, disabled American veterans, dedicated May 25, 1985. On October 13, 1969, Salisbury Park was rededicated as Dwight D. Eisenhower Memorial Park at a ceremony attended by the 34th President’s grandson, Dwight D. Eisenhower II, and his wife, Julie Nixon Eisenhower. Besides President of the United States, Eisenhower was a five-star general in the United States Army during World War II and served as Supreme Commander of the Allied Forces in Europe. 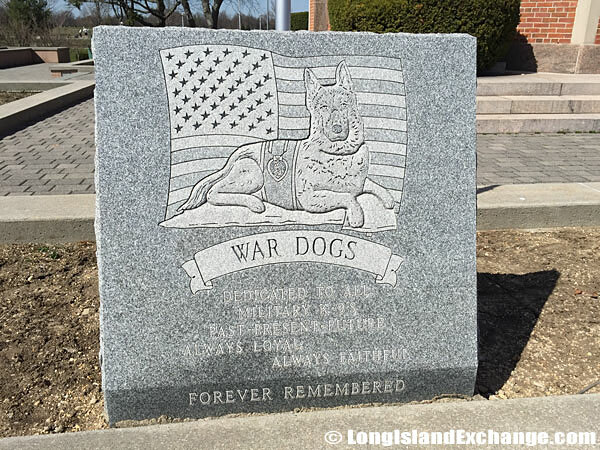 War Dogs, dedicated to all military K9s past, present and future, always loyal, always faithful, forever remembered. American paratroopers, Devils in Baggy Pants, pop up from nowhere and we never know how they strike next. Seems like they are everywhere. Excerpt from dead enemy officers diary. Dedicated to the memory of all paratroopers and glider-men. Their courage and valor in battle set the standard for all American fighting men. Airborne All The Way! 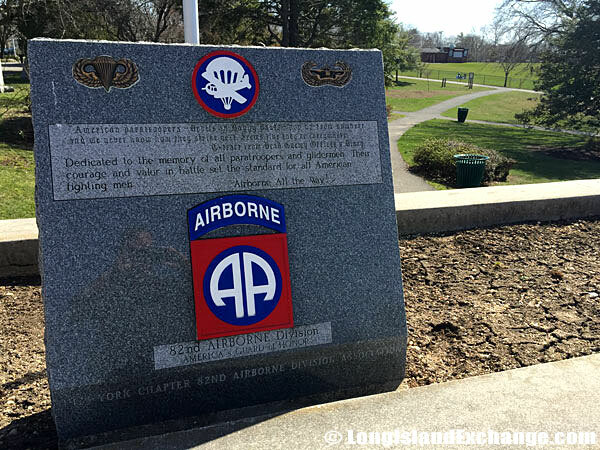 82nd Airborne Division. 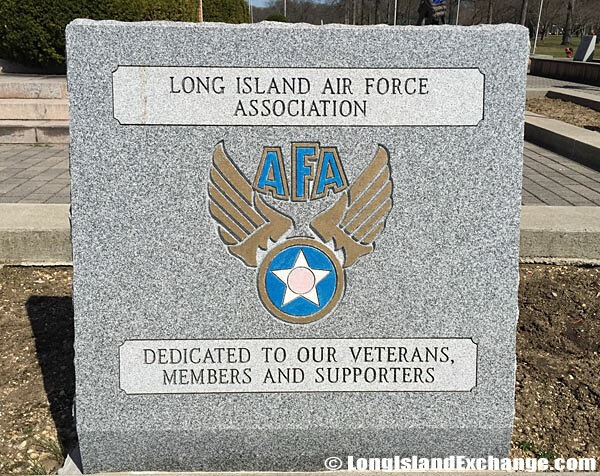 Long Island Air Force Association; Dedicated to our veterans, members and supporters. 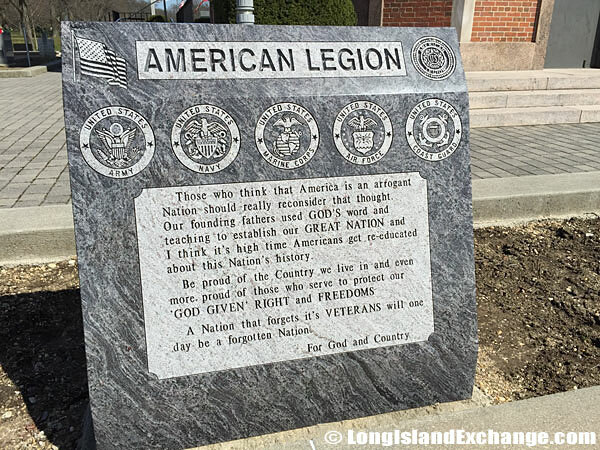 American Legion; Stone reads: Those who think that America is an Arrogant Nation should really reconsider that thought. Our founding fathers used GOD’s word and teaching to establish our GREAT NATION and I think it’s high time Americans get re-educated about this Nation’s history. Be proud of the Country we live in and even more proud of those who serve to protect our GOD GIVEN RIGHT and FREEDOMS. A Nation that forgets it’s VETERANS will on day be a forgotten Nation. For God and Country. Lest We Forget, 5th Marine Division. 28th Reg, 26th Reg, 27th Reg. Brothers and Sisters Then, Now and Forever. Two Vietnam Veterans organizations of like-minded people who endeavor to improve the lives of all who served during the war in Southeast Asia and to honor those who fought, died and remain missing. 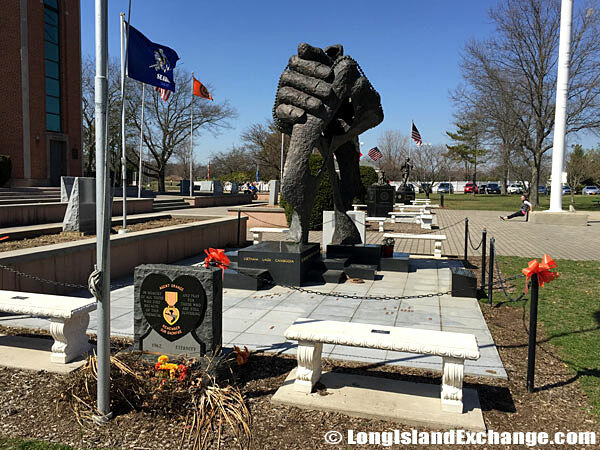 Vietnam Veterans of America Chapter 82, Nassau County. Veterans of Vietnam War Inc, Sgt Matejov, NY Post 3. The Harry Chapin Lakeside Theatre hosts a full schedule of entertainment events during the summer, from concerts to movies. 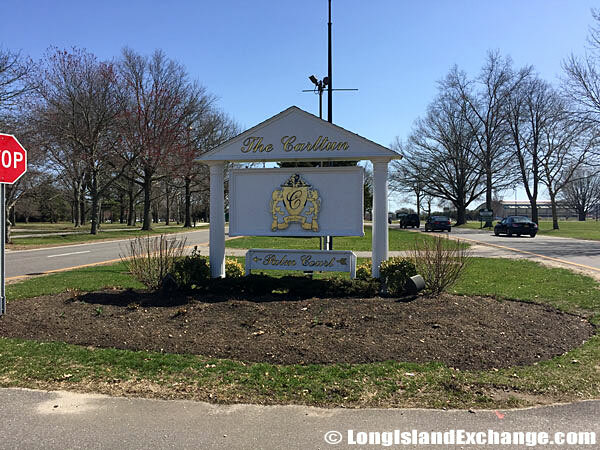 Carltun on the Park is a privately run restaurant operated in a former country club. The Carltun offers a restaurant, bar, banquet facilities, and a meeting room. The restaurant has played host to numerous events, including a fundraiser in 2004 for George W. Bush. Bush visited the park that year to dedicate its September 11th> memorial. The Harry Chapin Lakeside Theatre hosts a full schedule of entertainment events during the summer, from concerts to movies. Harry Chapin, of Huntington, sang “The Cats in the Cradle” in the 1970s. Chapin was killed in car crash on the Long Island Expressway on July 16, 1981. 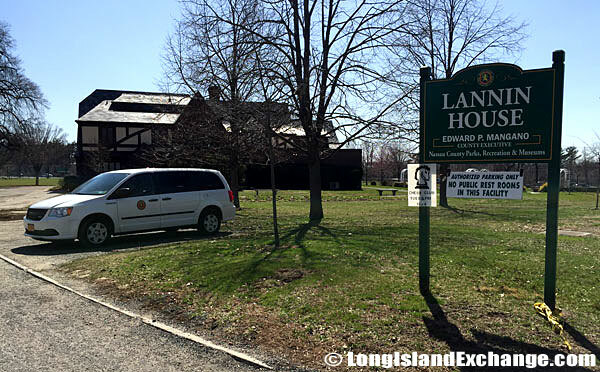 The Lannin Carriage House at Eisenhower Park, within Field 6A. 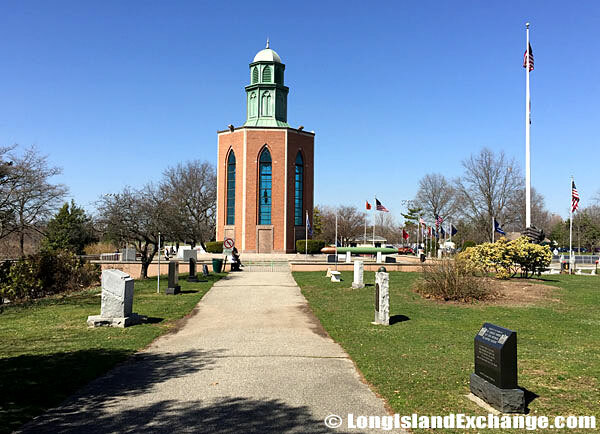 Joseph John “JJ” Lannin, who died on May 15, 1928 when he mysteriously fell from the ninth floor of his own hotel in Brooklyn, walked Charles A. Lindbergh across the tarmac of his Long Island airfield to see him off on his famous transatlantic flight. 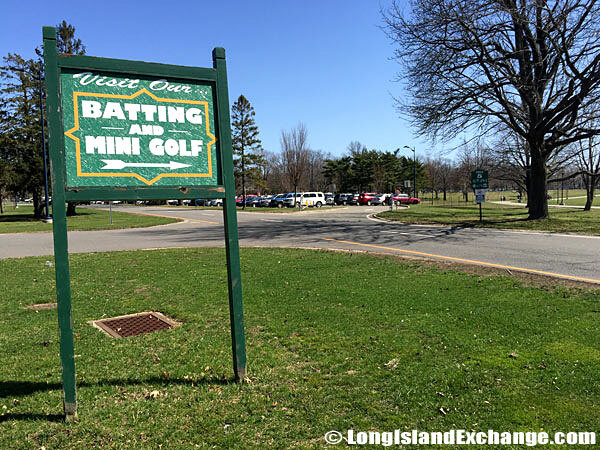 18-hole Miniature Golf Course near the Nassau County Aquatic Center. There is a Batting Cage with nine separate batting areas. 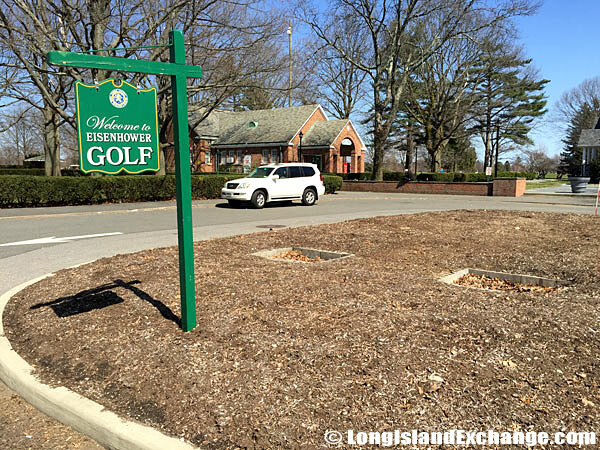 Three of Long Island’s finest golf courses are open to the public, including the famed Red Course. The Red Course has a storied history, having been designed by prominent golf architect Devereux Emmet in 1914 and having hosted Professional Golfers’ Association of America (PGA) championships as far back as 1926. 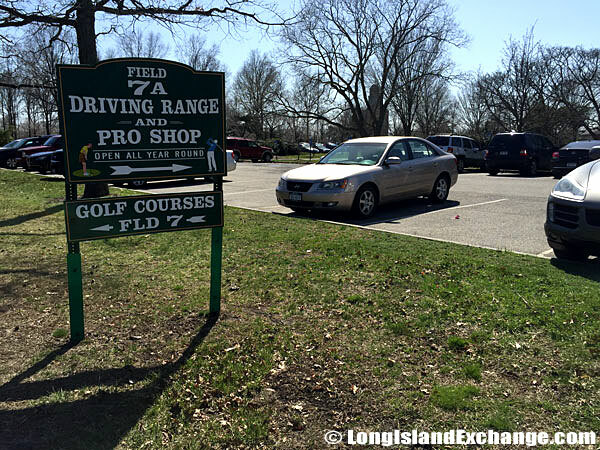 More recently, the Red course played host to the PGA Tour’s Commerce Bank Championship. 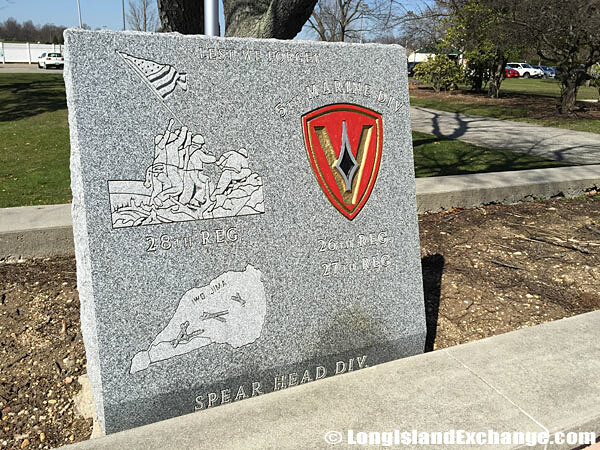 The large Veterans Memorial honors Americans who have served the country in war. 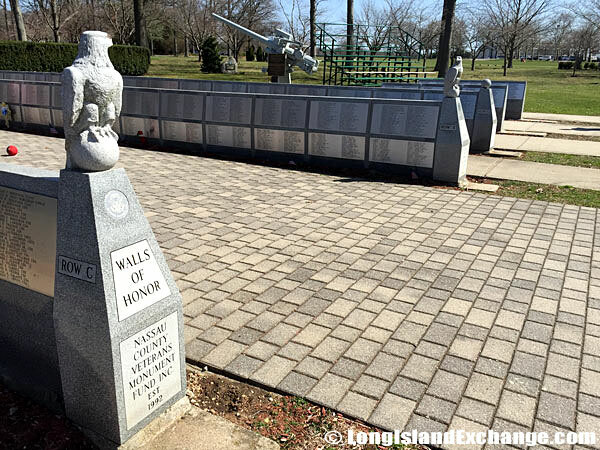 The area is surrounded with memorials of all kinds representing all wars and all branches of military. 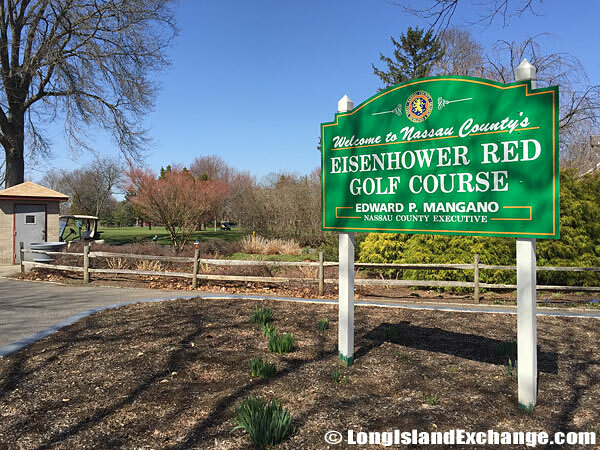 Three of Long Island’s finest golf courses are open to the public at Eisenhower Park including the famed Red course. The Red course has a storied history, having been designed by prominent golf architect Devereux Emmet in 1914 and having hosted Professional Golfers’ Association of America (PGA) championships as far back as 1926. A second championship-level course, the White course, was designed by Robert Trent Jones, a major 20th-century architect of American courses. Jones also designed the third 18-hole course, the Blue course. The Will Not Be Forgotten. A 50th memorial tribute to 1983. To the seven million Ukrainians who died of an imposed starvation by Soviet Russia in Ukraine 1932 – 1933. 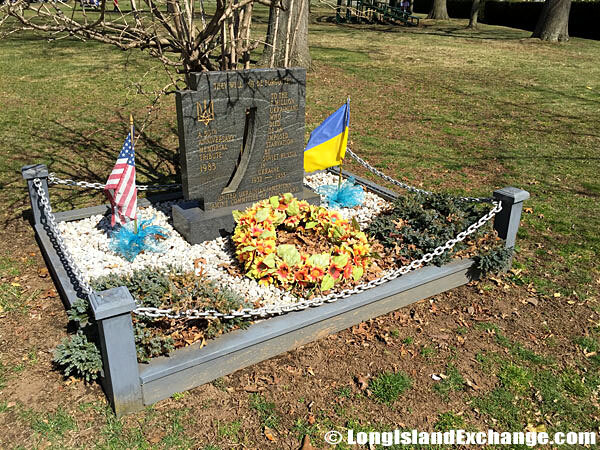 United Ukrainian American Famine Committee of Long Island. 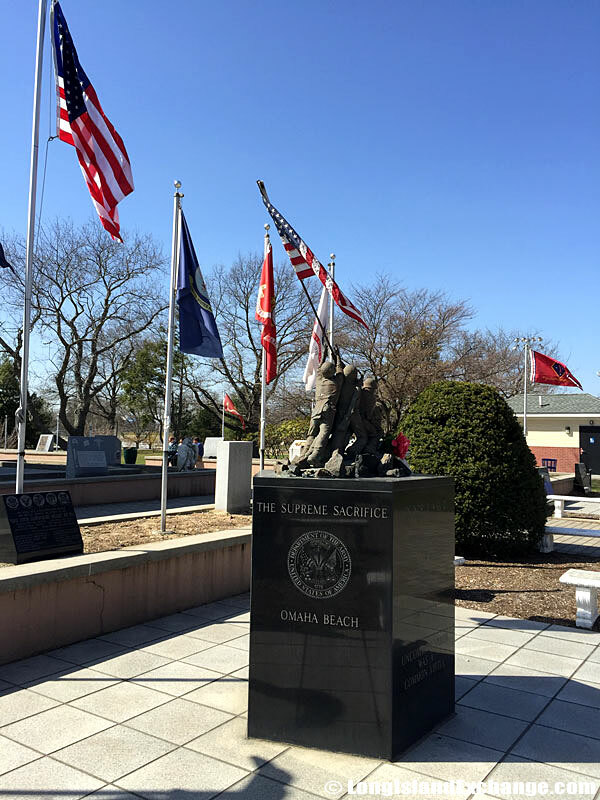 Dedicated to the USN Armed Guard of World War II. The armed guard of WWII came into existence on April 15, 1941. As USN Naval reserves began special gunnery training, on September 25, 1941. Orders were given to train 200 officers and 1000 men. 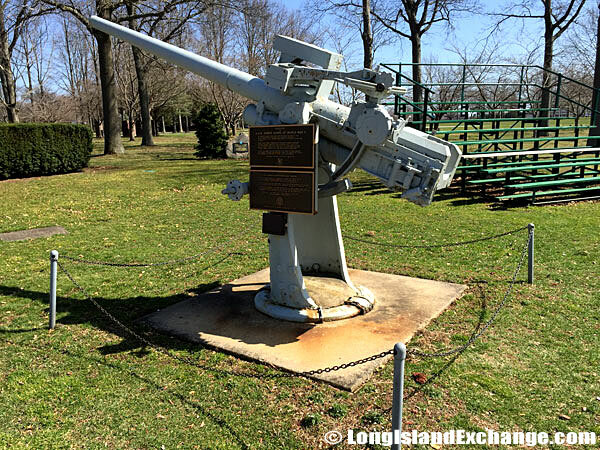 Armed guard crews consisted of officers, gunners, signalmen, radiomen, medics, waves and ship’s company. With a total of 144,970 personnel serving on 5236 ships, of the ships, 710 were sunk and many damaged, with 1810 killed in action or unknown injuries. Armed guard POW total was 27 with 14 survivors. To the 1,810 armed guards who gave their lives. To their familes and friends. The army and merchant crew that assisted us so well. This memorial is dedicated by their surviving shipmates. Our motto “We Aim to Deliver” and we did. 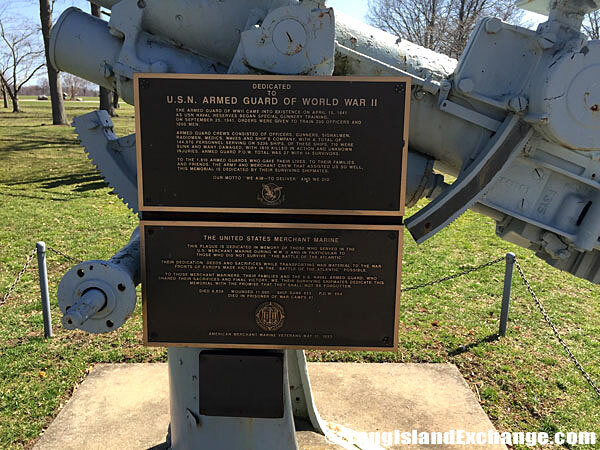 This plaque is dedicated in memory of those who served in the US Merchant Marine during WWII and in particular to those who did not survive The Battle of the Atlantic. Their dedication, deeds and sacrifices while transporting war material to the war fronts of Europe made victory in the Battle of the Atlantic possible. 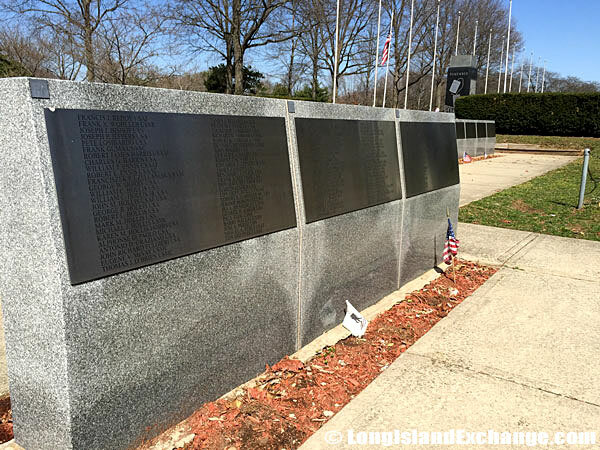 To those merchant mariners, their families and the US Naval Armed Guard, who shared their sacrifice and final victory, we their surviving shipmates dedicate this memorial with the promise that they shall not be forgotten. Died: 6,834, Wounded: 11,000, Ship Sunk: 833, POW: 604, Died in prisoner of war camps: 61. American Merchant Marine Veterans May 31, 1993. Blue Star Memorial by-way. A tribute to the armed forces of America, Second District, Federated Garden Clubs of NYS, National Gaurd Clubs, Inc.. 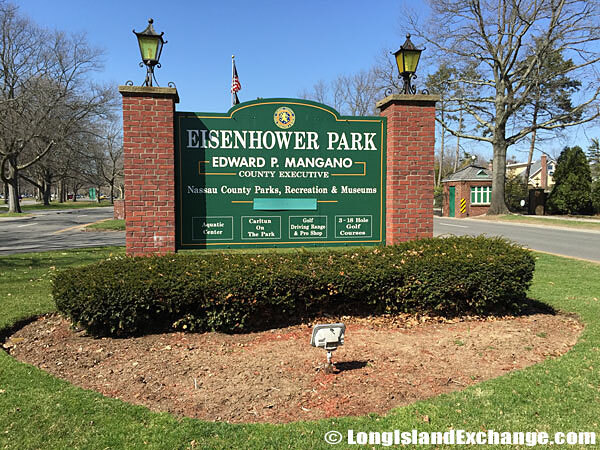 The Twin Rinks Ice Center is also located within Eisenhower Park, North of Hempstead Turnpike, adjacent to the Aquatic Center. The venue is a 165,000 square-foot ice skating and sports entertainment facility. Its NHL-sized skating rinks, one in and one outdoor, host roller and deck hockey leagues hockey tournaments, figure skating competitions and competitions year-round. A four-sided memorial statue in the Veterans Memorial Park. A plaque noting those who helped make the Veterans Memorials possible. 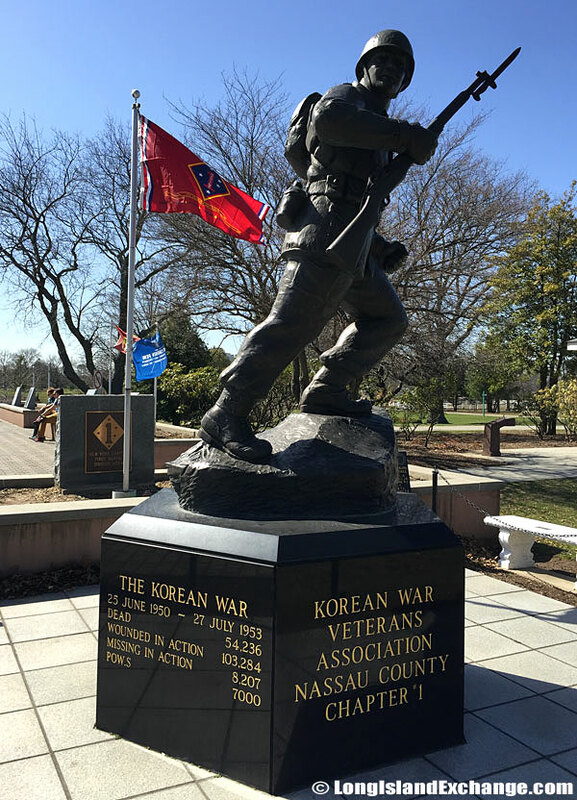 A statue for veterans of the Korean War by the Korean War Veterans Association of Nassau County, Chapter 1. The Agent Orange Memorial, dedicated to those who died becuase of this chemical and pray for those who are still suffering, remember our sacrifice, 1962 – eternity. 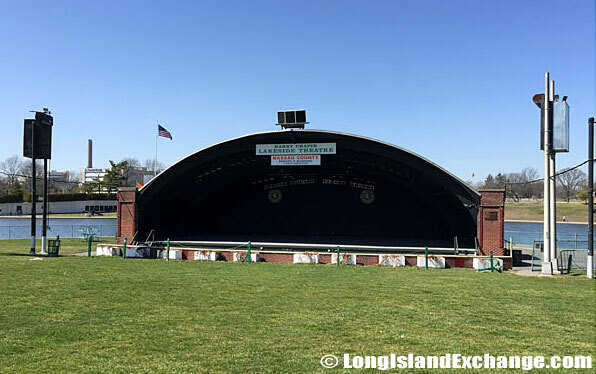 Eisenhower Park offers something for everyone including athletic fields, tennis courts, picnic areas, hiking trails, playgrounds, golf courses and the Carltun restaurant. On Thursdays In the summer, from about 7PM to 11PM, The Carltun Restaurant hosts live music on the patio for the 30-50s crowd. There are no dogs aloud on park grounds. Scenery, the environment and the cleanliness of the park are all reasons many visit often. 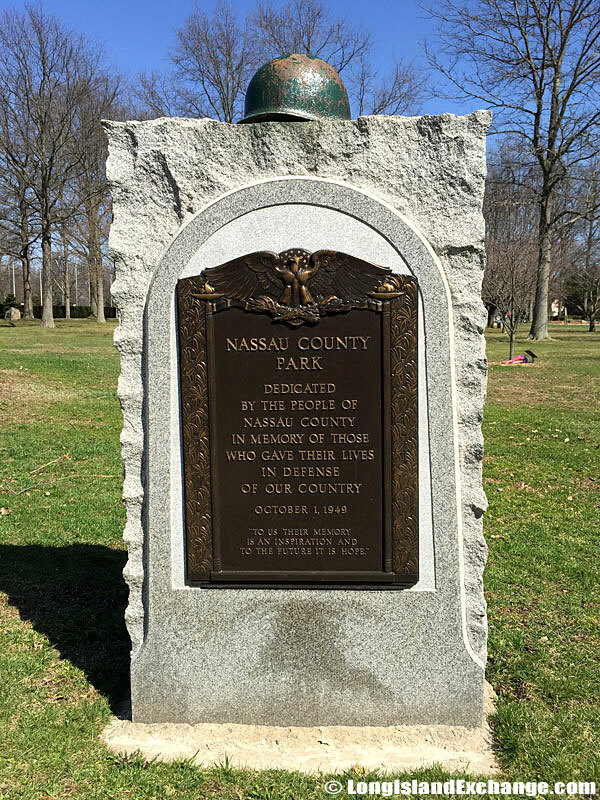 Nassau County Park, dedicated by the people of Nassau County in memory of those who gave their lives in defense of our country. October 1, 1949. To us their memory is an inspiration and to the future it is hope. 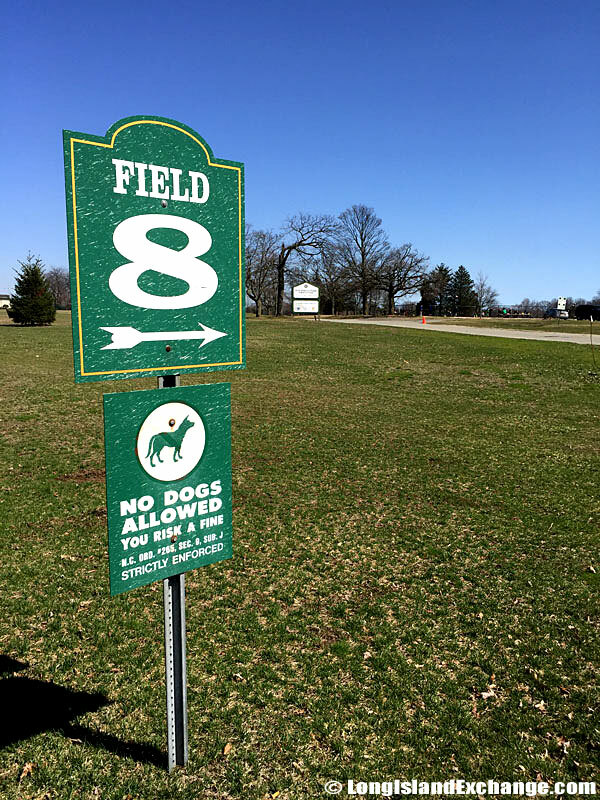 A sign points to Field 8. No dogs allowed or risk a fine, Nassau County ordinance strictly enforced. 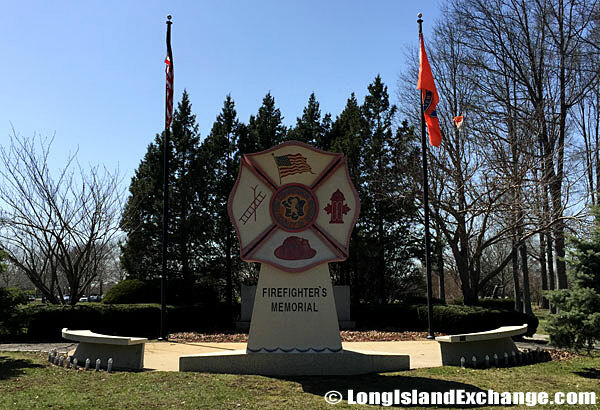 The firefighter’s memorial at Eisenhower Park. The Carltun at Eisenhower Park, Elegant event destination with a sleek American eatery for surf ‘n’ turf, wine cellar and cigar club. 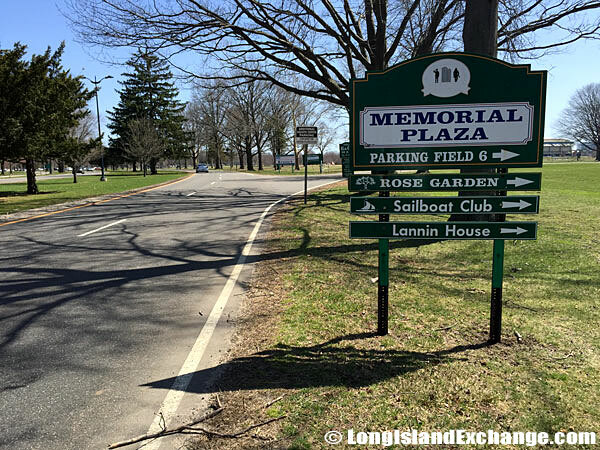 A sign points to the Memorial Plaza, parking field 6, the Rose Garden, Sailboat Club and Lannin House. 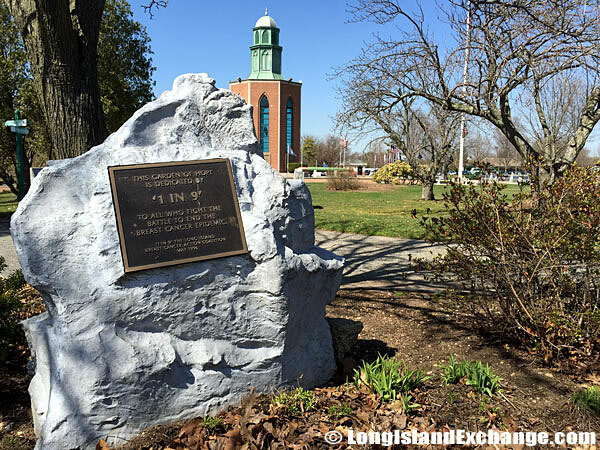 The Garden of Hope is dedicated by 1 in 9, to all who fight the battle to end the breast cancer epidemic, ‘1 in 9’ the Long Island Breast Cancer Action Coalition, May 1996. 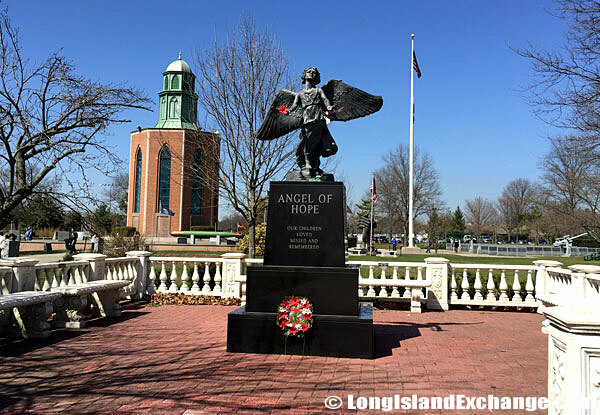 The Angel of Hope Statue in Eisenhower Park. For all parents and families who have endured the death of a child. A candlelight healing ceremony is held at the base of the Angel monument each year the first Saturday in December at 4pm. After a few remarks, a moment of silence, attendees are invited to leave a white flower at the base of the angel statue. The public is welcome.